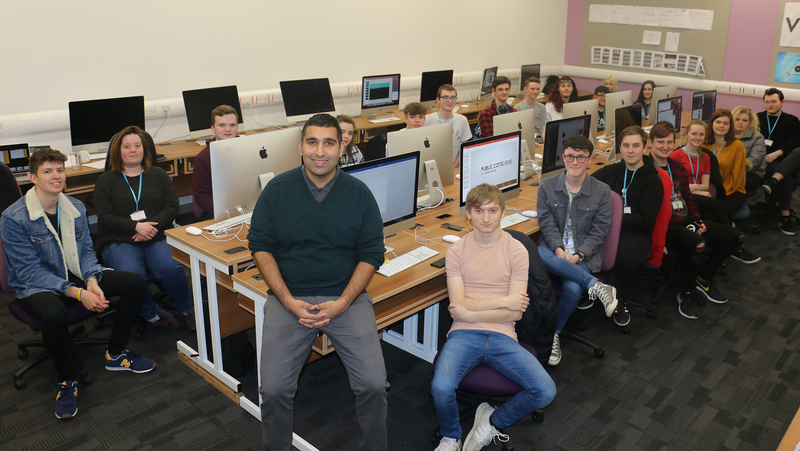 A star of hit television show Gogglebox has taught media students vital skills for the classroom and shared his industry insights – as part of a national competition that offers the winners a trip to London to see it being produced. Baasit Siddiqui, who along with brother Umar and father Sid has appeared on the award-winning Channel 4 show since it launched in 2013, visited West Nottinghamshire College to deliver his Let’s Pitch It educational workshops. The former school teacher combines his role as an armchair television critic with running his own company, Siddiqui Education, which offers the innovative workshops and competition to schools and colleges across the country. Now in its second year, Let’s Pitch It sees students working in small groups to plan, present and advertise a new television show or media concept. Students on the BTEC National Extended Diploma in Creative Digital Media Production course were tasked with researching the types of TV shows that are currently popular, before creating a presentation to showcase their idea, and developing a two-minute video pitch or advert to television executives. Students will now spend the coming weeks preparing their pitches to submit for the next stage of the competition, following the one-day workshop at the Derby Road campus earlier this week (Monday 21 January, 2019). Baasit will shortlist the best pitch from each participating institution, with the top three proposals being judged by Gogglebox creators and executives. The winning group nationwide will win digital equipment for their school or college, vouchers for each group member, a trip to Studio Lambert in London to see an episode of the BAFTA and National Television Award-winning programme being edited, and a video message of congratulations from the Siddiquis. “Baasit showed us how to create a presentation that people who work in the industry would expect to see when considering a new TV programme. “My group’s concept is for show called ‘Flipped’, which puts an offender and their victim together. The offender would see the effect of their crime on the victim, and the victim gets to see why the offender committed the offence in the first place. It’s about changing people’s outlook on what happens when people come out of places like prison and have received some kind of help. “The workshop was really informative and I learnt a lot about myself and my peers. I really enjoyed working with Baasit; he had lots of great advice and it was nice to do something different. “Our idea was for a programme called ‘What’s It like To Be In Your Shoes?’ where grown-ups and children swap roles. The adults become the kids for a week, and the kids become the adults, to see if they can manage – like a twist on the Wife Swap programme. Baasit, who previously spent ten years as a secondary school and sixth-form teacher and department head, launched Siddiqui Education in 2018, which combines his teaching experience and media contacts gained from his involvement in Gogglebox. In addition to the competition element, the bespoke workshops encourage collaborative learning while developing young people’s social, emotional and digital technology skills. “We covered research, planning, communication and team-work – all transferable skills that are used day in, day out. Although we’ve linked them to a TV setting, these are skills that you need in any business and any kind of work; and throughout your educational journey as well. “I’ve been really impressed with the students’ level of creativity and originality. I’ve witnessed some ideas that I’ve never heard of before – and I could see that they’ve taken things they are surrounded by in their environment and made them the premise of their show; whether that’s social media, their frustrations with politics, and issues regarding people’s social attitudes. “You can come up with the ‘next big quiz’ but I always love it when students are so passionate about the way that society is changing. Baasit’s workshops at West Nottinghamshire College were organised by DANCOP (the Derbyshire and Nottinghamshire Collaborative Outreach Programme) – a partnership of universities and colleges that are working together to raise the aspirations of young people and encourage them to consider higher education. It currently has a team based at the college.